Hi Blogging friends. Beautiful sunny day today. although it is cold and we had some snowflakes this morning. I made an Easter Card today, trying to get enough for family and friends. Easter is early this year, so now I am behind. 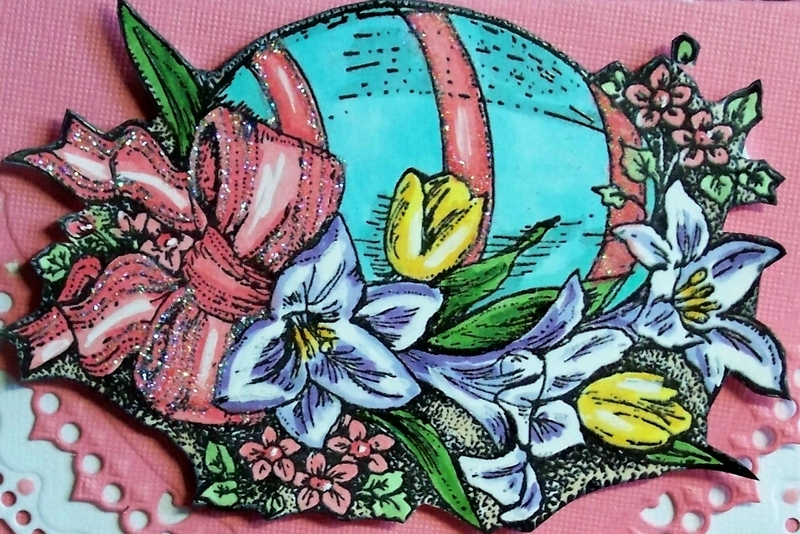 This beautiful Easter Egg is a stamp from Northwoods Rubber Stamps. Paper - White and Coral textured card stock. Sentiment is a dollar stamp from Michaels. 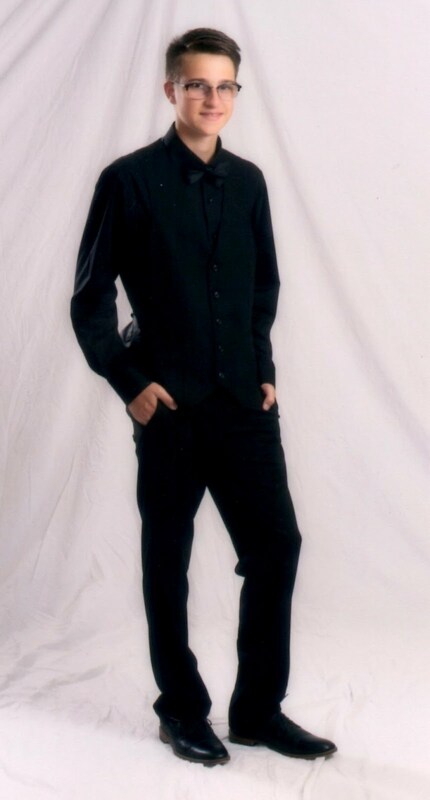 This is gorgeous Sue. I love the image, beautiful colours and such a fabulous shape and sentiment. Such a bright cheery card. I hope Easter Day is bright and cheery also. Who knows with this weather, we could have another snow storm on Easter. 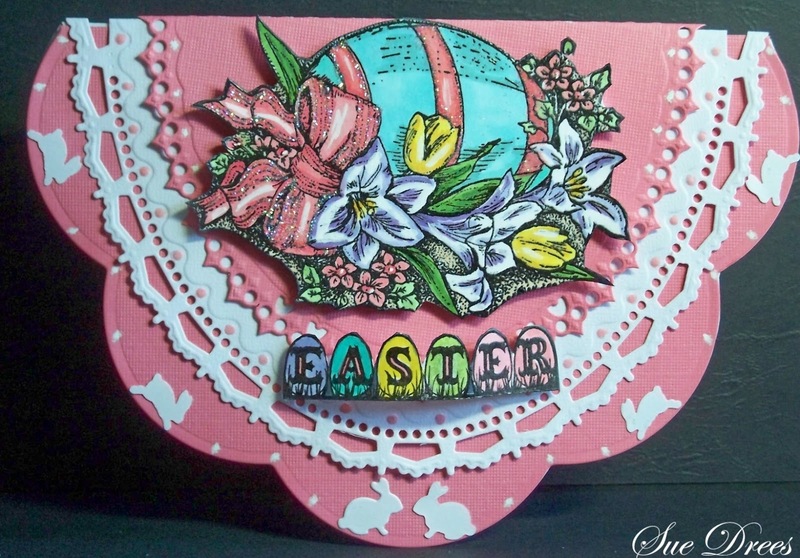 Your little bunnies and other embellishments all add so much to the whole card. Great picture of Keeya. She's G-O-R-G-E-O-U-S! Hello from Australia Sue, I have just joined as a new member. Beautiful Easter card and the colours and stamp are just gorgeous. I'll be back to look at more...luv aNNIe..
What a gorgeous Easter card Sue! Loving the shape and your fabulous colouring! Beautiful card! North woods has some great images! Glad you joined us at Sweet Stampin'. Gorgeous card, love the image and pretty details. Thanks for joining us at AGOAC. This is such a sweet card, lovely image and the bunnies around the edge are delightful. Thanks for sharing with us this week at My Time To Craft.